Aaron had a movie theme for Valentines Day this year. He got us tickets to see "Valentines Day" and he got me this microwave popcorn popper. I love the popper. 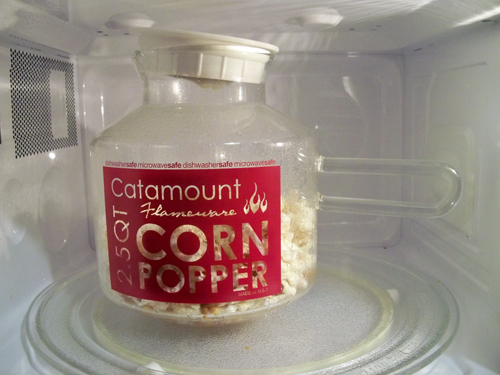 It even has a mesh lid that you can put butter in so it melts as the popcorn pops and coats the popcorn. Yum! Mmm, looks good. I love popcorn! Where did you get that from? I think he got it at Wegmans! That looks awesome... I just use a paper bag closed with a pin, but wish I had something like that! I am heading over to Wegman's at lunch to pick up one of these! Bummer, we don't have Wegmans in Los Angeles. You can order one through Amazon. Guess what my sister is getting for her birthday? I've so been eyeing this, I think I saw it at Crate and Barrel.